After three weeks in Africa, Kris and I have returned for the cozy confines of Rosings Park. There was one less cat to greet us this time — which makes me very sad — but it’s good to be home just the same. It’ll take me some time to piece together each travelogue, but I hope to keep them just a couple of days apart. I’ll post-date them, as you can see. This entry is dated February 10th, even though it’s being published on the 28th. Enough with the preliminaries! Let’s enter Africa. Note: This is actually the second part of this vacation journal. The first part detailed what I packed for Africa. Before we’d even left the U.S., I made my first mistake. I decided that I wanted to buy some South African rand so that I’d have a little spending money. At Dulles International Airport in Washington, D.C., I paid $310 (and a $9.95 commission) to purchase R1800, for an exchange rate of about R5.63 per dollar. At OR Tambo International Airport in Johannesburg, other members of our group were buying getting R7.10 to the dollar (with a R49.95 commission). My $310 would have bought me R2151 in Johannesburg, which is the equivalent of R6.94 per dollar. “That’s how it always is,” said Sammie, one of our companions. “You always get a better deal at the destination airport. And you always get a better deal at the airport instead of a bank.” I’m not sure this is 100% true, but it was certainly true in this case. Lesson learned. Our flight from D.C. to Johannesburg was long — 17 hours long, including a re-fueling stop in Dakar, Senegal. I slept very little (because it’s almost impossible for me to sleep on planes). So, after taking the 18:30 bus to the hotel, Kris and I immediately crashed, sleeping from 20:00 to 01:00. We both woke for a couple of hours (and watched Downton Abbey on the iPad) before falling back to sleep at 03:00. In the morning, we ate a quick buffet breakfast — the first of many buffet meals — before boarding the bus for a tour of the Johannesburg area. Note: Our bus was apparently the Kaizer Chiefs team bus. (The Kaizer Chiefs are a powerful soccer team based in Soweto, a Johannesburg township.) As a result, everywhere we drove, people (especially young men) smiled and flashed us the “v for victory” sign. Well, except for the folks who support the Orlando Pirates, another Soweto-based team. The typical reaction when young men saw our Kaizer Chiefs bus. Our three-week tour was led by Brian, a native South African. He provided a lot of background and “color” to the trip, which made things more interesting. 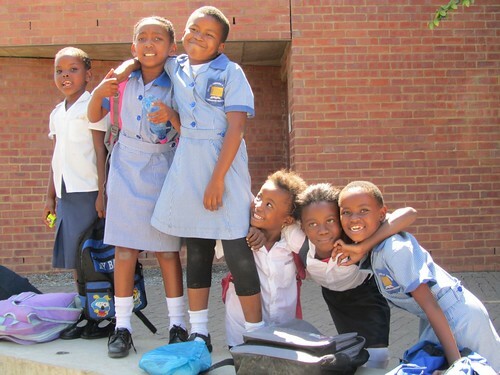 In South Africa (and Zimbabwe), all schoolchildren wear uniforms. But Brian says that race is less of an issue than it was in the past. South Africa is known as the Rainbow Nation, and the people take pride in their multi-racial culture. (On the trip, I did a lot of reading about Nelson Mandela, who actively promoted racial harmony, even though he had valid reasons to hate the Whites.) Because there are diverse races and political opinions, people have learned to get along. Brian says that people who disagree politically can still be good friends. Note: South Africa has eleven official languages, though nearly everyone speaks English (and all of the signs are in English). Because there are so many languages, everyone speaks with a different accent. Dutch descendants, like our guide Brian, speak with something very much like an Australian accent. We stopped briefly at Church Square before driving up the hillside to the Union Buildings, the official seat of the South African government (and nominally the home of the country’s President). Kris and I spent our time wandering the lovely gardens, looking at the birds and flowers, and enjoying the summer sun. The sweet scent of one flower (we couldn’t figure out which) reminded me vaguely of the orange blossoms in Belize. 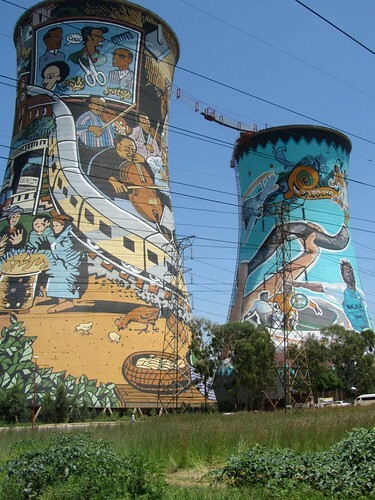 Orlando Towers in Soweto. As seen on The Amazing Race! 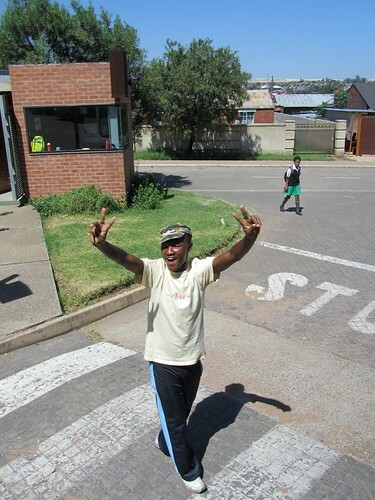 After Pretoria, we drove to Soweto, where we picked up S’nothilie, our local guide. We drove through East Orlando, then stopped in West Orlando for lunch at Sakhumzi, where we enjoyed an African buffet and blueberry ice cream. Well, I enjoyed the lunch. Kris was sick. She’d picked up a bug somewhere along the way, and couldn’t keep food down. She was miserable on this day (and then again two days later). After lunch, we visited the Nelson Mandela House, which is just across the street from the restaurant. Soweto was interesting. It started as a township for Blacks drawn to Johannesburg to work on the gold mines. (Soweto is an abbreviation for South Western Townships.) Black and White were kept separate, even before the official policy of apartheid. Though the area’s origins are poor, and many poor people still live there, especially in the “informal settlements” (which most people know as shantytowns or squatter camps). Now, though, there are homes with Mercedes and Lexus cars in the drives. Brian told us that Soweto has more millionaires than any other South African city. As a result, driving through the townships — both in Johannesburg and later in Cape Town — was an adventure in contrasts. The rich and the poor live side by side. A typical shantytown in Soweto. Click to enlarge image. In the afternoon, we returned to the hotel. I swam while Kris rested. In the evening, we had a big welcome dinner, where we sat next to Jerry and Suzanne. Jerry is a former airline pilot, and Suzanne is a former flight attendant. During the late 1990s, they lived for three years in London, followed by a year in Paris. They loved it. The four of us talked about books, photography, travel, and more. Note: On our tour of Italy, many of our companions were older (meaning retired). We were the youngest. On our river cruise in France, all of the people were older. We were the youngest. And on this tour of Africa, again our companions were older. We weren’t the youngest — Ruby is thirteen years old — but we were nearly so. A short (2:07) video of our first day in Africa. As the trip progressed, I took more (and better) video. After a long first day in Africa, Kris and I hit the sack, ready to rise early to board a plane to Zimbabwe. Note: One commenter on my last post complained that I was using the term Africa to refer just to one country (or a handful of countries). “It’s downright weird and part of the legacy of racism and America’s views about Africa,” she wrote. I disagreed in a reply to that comment, and after spending three weeks in Africa, I disagree even more. The people in Africa — in all five countries we visited — also use the general “Africa” all the time, even when they mean just one or two countries. “Welcome to Africa”, “In our African culture…”, “In Africa, we…” and so on. Being in the Kaizer Chiefs bus was a blast. People would see it and point and stare, then peer inside curiously to see forty old white people instead of their favorite athletes. But as soon as I learned to flash them the “V”-sign, I loved seeing the joy on their faces as they responded in kind, laughing along with me as though we were sharing a fabulous joke. I think South Africa has made great strides in the twenty years since apartheid ended. In fact, although great discrepancies remain, they appear to be further along a productive path than many parts of our own race-conflicted country. Everywhere I heard people of all skin colors stress forgiveness and reconciliation rather than resentment, while at the same time acknowledging the injustices that the nation was built upon. They have had great leaders in the struggle for civil rights. JD, I Capital-L Love your travel posts. I love to travel as well, and your posts are like candy. I may have missed this somewhere, but was this another Rick Steves group trip? JD – the universe is giving you a little tap on the shoulder with the demographics of your last two trips…maybe it’s time to try ditching the tour groups, striking out on your own for international travel. You and Kris will be rock stars at it, I’m sure. You’ll no longer be the youngsters with a bunch of older folks, and you’ll organically meet a lot of younger, cooler travelers along the way even without a tour. I think it really depends on the type of tour group you’re with, and the type of trip you’re doing when it comes down to making the decision of tour group or solo travel. We just got back from a two week vacation- a week in Ecuador in the Galapagos Islands and a week in Peru checking out Cusco, Lima, and of course Machu Picchu. We did a small ship cruise for the Galapagos islands and there were only 24 people on our ship. The Ecuadorian law requires you to to be accompanied by a guide to visit any of the islands, so you’re kind of forced to do a tour group type trip anyway. My partner and I are 27 and 31, and we went with his parents, 64 and 65, and his sister and brother-in-law (34 and 35). There were two other people in their late 20’s, early 30’s, everyone else was 50+, about 6 people were retired. But those people were awesome. They were from all over the world, and had traveled extensively. We had a fabulous time, and it didn’t feel “touristy” or like a herd of cows being shunted this way and that. In Peru, it was just the 6 of us and we had one guide, Joaquin, who accompanied us to sites and to Machu Picchu. It didn’t feel like a tour group there either, since it was just our family. No flags, no megaphones, very laid back and by the end of it Joaquin was very missed when we left Peru! I think it helps to really suss out the experience you want, as well as have a good grasp of what kind of a tour company you’re going with. Same thing with cruises. I know some people that hate them unilaterally, and others who ONLY travel via cruise. I don’t agree with either approach. Sometimes cruises can be great- as in our Galapagos experience on a very small, very nice ship with only 24 people, and usually only half did expeditions, and sometimes less, so there were times when it was 6 of us, a guide, and no one else on these beautiful, empty islands. I’m really enjoying the trip updates, I’m glad I clicked over here from Get Rich Slowly!